Well, this is my first food-related post and it’s about a culinary failure! Last night I baked potatoes. We have been dealing with sick children for the last couple of weeks, and I figured we needed to eat some comfort food. A hot, stuffed baked potato sounded like the perfect thing. Problem was… it’s been years since I’ve baked a potato. In my recollection, it takes about an hour or so for potatoes to bake. But I didn’t want to chance it, so I headed for Google to look it up. The first couple of hits offered the recipes for “perfect” baked potatoes. It may sound crazy to look up a recipe for baked potatoes, but, like I said, I didn’t want to take any chances. We needed some serious comfort! 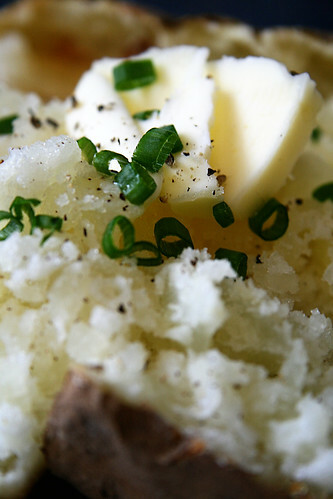 I cleaned the potatoes, pierced them, coated them in olive oil, and sprinkled them with kosher salt. I threw them in the oven and baked them at 350F. I set the timer for one hour and started cooking the bacon, preparing the salad, and getting out all the fixings. I had planned this so that the potatoes would come out right when my wife got home from tutoring. Wife came home, the timer went off, and I checked the potatoes. They were hard. Like bricks. Uh-oh. And the family was ready to eat. I reset the timer for 30 minutes. I tossed the salad and heated up leftover chicken. I served the family dinner, but I did not eat. I continued to check the potatoes every 15 minutes for another hour. Finally, they were ready. That sweet baked potato smell permeated the kitchen and dining room. I felt happy. Briefly. I announced that the potatoes were ready, only to discover that the kids were in bed and my wife was getting ready for bed. Not good. I needed comfort food more than ever! So I sat at the table, alone, with a piping hot baked potato stuffed with butter, sour cream, bacon and cheddar. I would have preferred to have my family with me. But, apparently, I bought really big potatoes! Next time, I will allow more time for baking… or buy smaller potatoes!